Aviation is tricky. Conditions can change en route. That may be what's happening with air service between the U.S. and Cuba. Fidel Castro is dead and Donald J. Trump, no fan of the Cuban regime, is President-elect of the United States. It's a big sea change from a few months ago, but U.S. airlines so far see no need for a course correction. 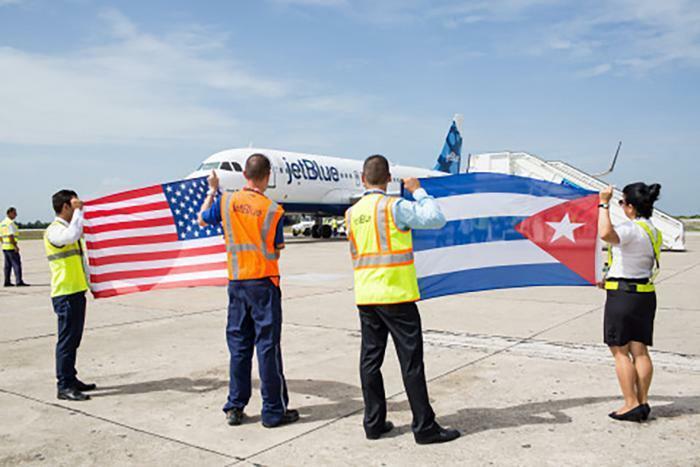 JetBlue yesterday flew its first flight from New York's John F. Kennedy International Airport (JFK) to Havana’s José Martí International Airport (HAV). JetBlue had earlier started flights to other destinations in Cuba and opens service to Havana from Orlando today and from Fort Lauderdale-Hollywood tomorrow. Other airlines flying from the U.S. to Cuba include Alaska, American, Delta, Frontier, Southwest, Spirit, and United. Along with JetBlue, they plan to operate a combined 155 flights. Trump's upset win may prove to be a stiff headwind, however. In a tweet late yesterday, Trump said that unless Cuba is willing to make a "better deal" he may terminate moves to re-establish ties between the countries. Mauricio Claver-Carone, a fierce Castro critic, who leads a pro-embargo group, has been named to Trump's transition team for the Treasury Department, which could herald a sea change in U.S.-Cuban relations. However, Trump transition communications director Jason Miller told reporters yesterday not to jump to conclusions. “Cuba is a very complex topic and the president-elect is aware of the nuances and complexities regarding the challenges the island and the Cuban people face,” Miller said, according to Politico.